Big “M” Casino South Carolina – TWO Luxury Yachts to Choose From! 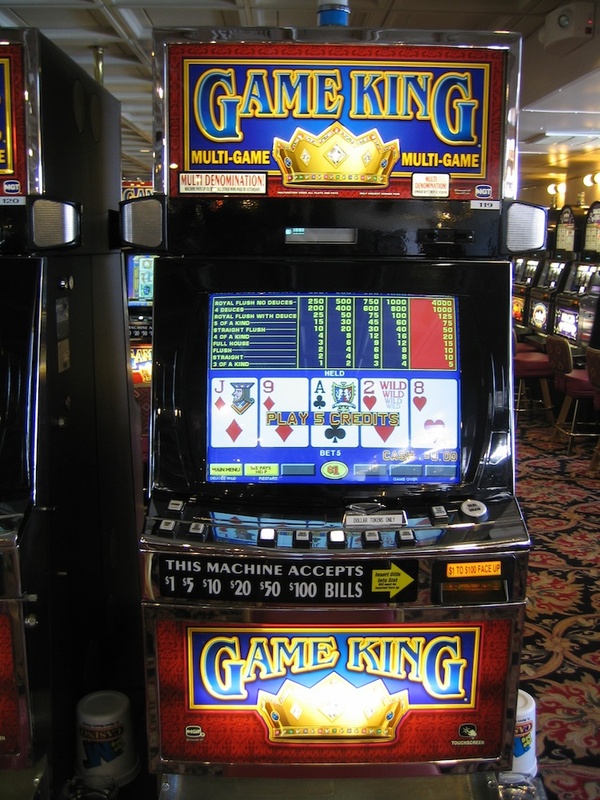 When was the last time you joined us on one of our gambling cruises? Are you ready to experience an awesome time filled with fun and excitement? Have you checked out our current specials lately? We all find ourselves caught up in the same old routine. Step back for a moment though and remember the last time you had a day or evening out! Has it been a while? Do you find that you keep putting off making reservations for a gambling cruise because you remember what it is like to be in a smokey casino? Or perhaps you are concerned that the casino won’t have the games that you enjoy. 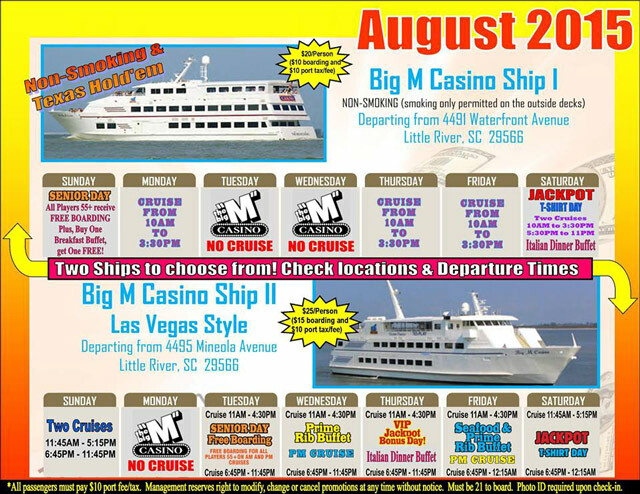 Times have changed, the Big “M” Casino South Carolina now has TWO luxury yachts to accommodate you! 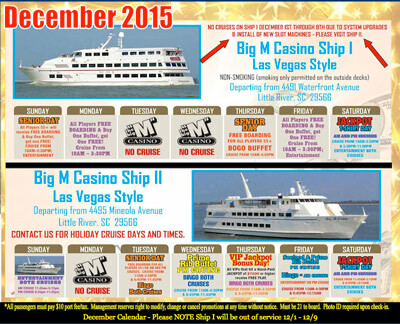 This Year Celebrate New Year’s Eve Aboard The Big “M” Casino! Are you ready to bring in New Year in with a bang? Do you enjoy gambling, cruising, an awesome buffet and entertainment? Did you know that you can experience all of the above on The Big “M” Casino Ship I’s Non-Smoking Cruise? Do you usually end up spending a quiet night at home on New Year’s Eve – or do you make plans to party with your friends? Are you looking for something new to do this year? We have you covered! We offer you the best of both worlds – come alone or bring your friends for an unforgettable New Year’s Eve! Join us on our non-smoking casino cruise for a delicious buffet, your favorite casino games, and a visit to our upper deck to enjoy our DJ and Percussionist! 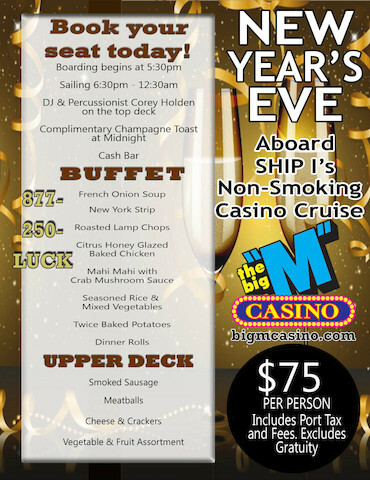 What better way to enjoy the countdown to the New Year than on The Big “M” Casino Ship with a complimentary champagne toast at midnight! There’s no reason to wait, we all know how fast the next month will fly by – so book your reservation today! Mark your calendar – boarding begins at 5:30 pm and sailing is from 6:30 pm to 12:30 am. It’s Time to Board a Big “M” Casino Cruise Ship – Myrtle Beach! 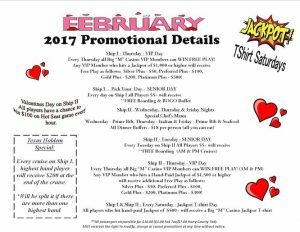 Interested in becoming a “Recent Winner” on a Big “M” Casino Cruise Ship – Myrtle Beach? Is it time to brush up your gambling skills? Don’t forget to check out our Current Specials? Have you ever looked at our “Recent Winners” page and wondered what it would be like to win a jackpot? Or perhaps, you already have. Either way, the thrill of winning is unforgettable! 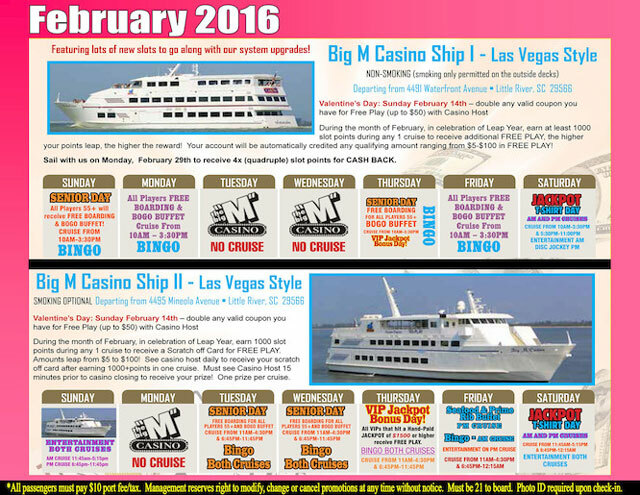 Ready to Enjoy a Fun Casino Cruise on The Big “M” Casino Ships? Looking for a great way to spend a day or an evening? Have you reviewed our February calendar? What about our Specials this month? Have you been thinking about joining us on The Big “M” Casino, but for some reason you keep putting it off? Well, now is the time to reserve your spot on either one of our two ships and experience some unforgettable memories! Do you feel like you are stuck in a rut lately? Looking for something fun and exciting to do? When was the last time you visited a Big “M” Casino Ship? It isn’t hard to get stuck in a rut. Before you know it, weeks turn into months and months into a year, and you have fallen into a rut of doing the same things over and over. Whether it is watching movies or playing online games, let’s be honest it can become a rut. When you interact with real people, in a casino setting that offers table games and slots, that’s when fun and excitement really happen! 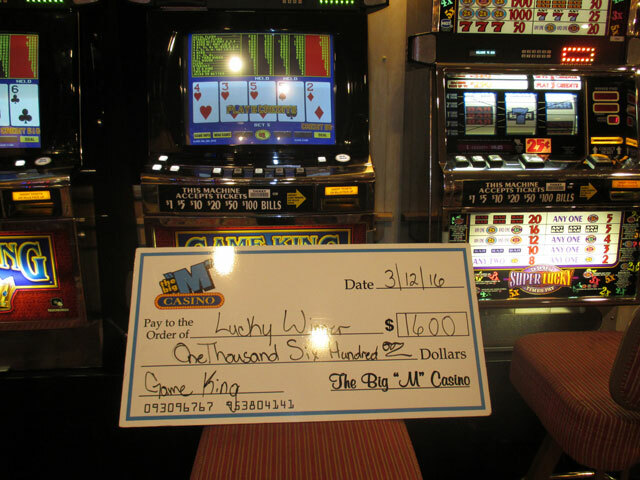 The Big “M” Casino Myrtle Beach – The Perfect Way to Celebrate the Holidays! Looking for something special to do this holiday season? Have a last minute party to plan? Wondering how you are going to celebrate the New Year? This time of the year seems to fly by. Before you know it, it will be 2016! 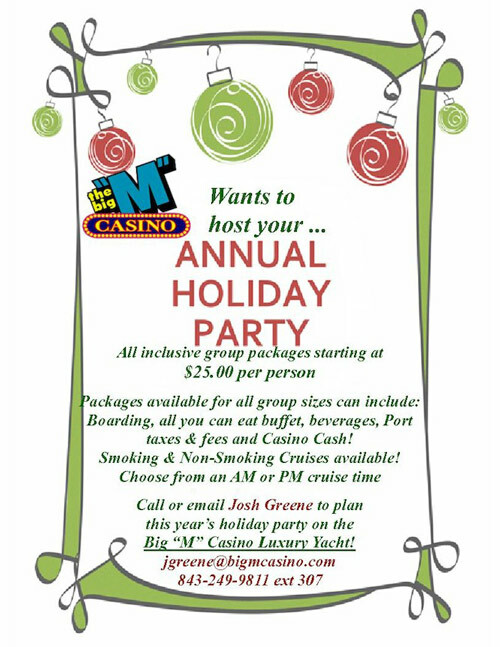 Don’t miss the opportunity to celebrate the holiday season with The Big “M” Casino team. The Big “M” Casino Myrtle Beach has all the answers! Here’s our December Calendar – Enjoy a December Cruise! 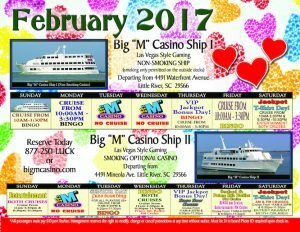 Are You Ready to Cruise on Our Big “M” Casino Ships – Myrtle Beach? Have you cruised on The Big “M” Casino Ship I? – Offers Non-Smoking and Texas Hold’em! 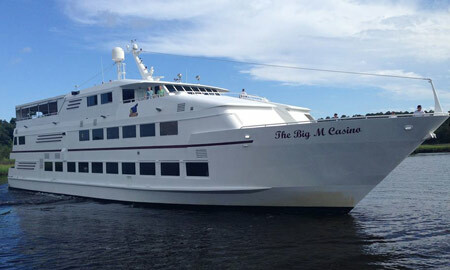 Or maybe you prefer The Big “M” Casino Ship II? – Our Popular Las Vegas Style gambling! August is around the corner, and our August calendar is ready for you to review! 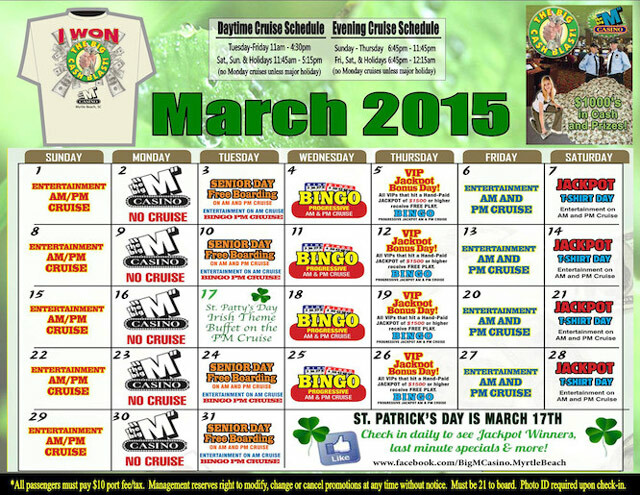 Big “M” Casino Myrtle Beach Is Offering a Fun-Filled March!!! Are you looking for some ideas on how to add some fun to your days or evenings this month? Do you enjoy watching the dolphins swim alongside the boat, having a superb buffet, taking in a beautiful sunset and having a chance to win BIG on The Big “M” Casino? Did you know the month of March is THE BIG CA$H BLAST, and we are offering $1000’s in Cash and Prizes? Check out our calendar, mark the dates you would like to join us, and make your reservations now! March is the month of opportunity!